A number of people have asked me what I make of this piece from James Bamford, pitching the case against Maria Butina as a grave injustice, just after Paul Erickson (who may be the real intended beneficiary of this piece) was charged in the first of what is likely to be two indictments, and as the government extends her cooperation by two weeks. There are parts that are worthwhile — such as his argument that because Butina didn’t return a bragging email from JD Gordon, it suggests she wasn’t trying to recruit him. There are other parts I find weak. Bamford oversells the degree to which the press sustained the serial honeypot angle — after all, some of us were debunking that claim back in September, when he appears to have been silent — without mentioning the fact that Butina first started proffering cooperation with prosecutors, presumably against Paul Erickson and George O’Neill, on September 26. The word “visa” doesn’t appear in the article’s discussion of Butina’s status as a grad student, leaving unrebutted the government’s claim that Butina chose to come to the US as a student because it provided travel privileges that served her influence operation. Bamford (who hasn’t covered the Mueller investigation) grossly overstates the significance of Mueller’s choice not to integrate Butina’s case into his own investigation. He also falsely treats all counterintelligence investigations into Russia as one ongoing investigation (see this post for my ongoing complaints about virtually everyone doing the same). 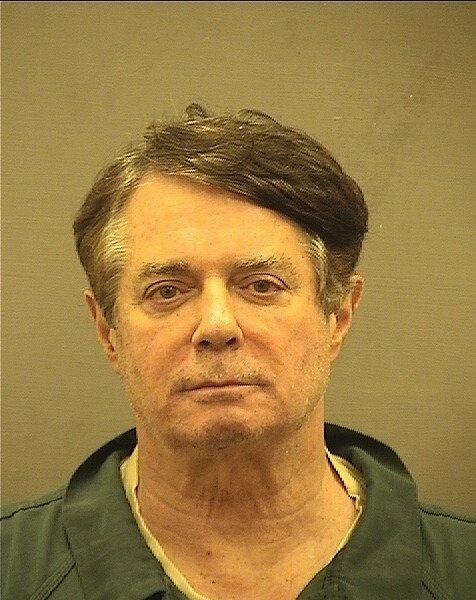 He suggests that Butina will need to be traded for Paul Nicholas Whelan, when the government has already said she’ll be deported once she serves her sentence (which will likely be time served). He quotes Putin’s interest in Butina’s case, without noting that Russia has only shown the interest they showed in her in one other defendant, Yevgeniy Nikulin. And those are just a few of the details with which I take issue. But these passages, in particular, strike me as problematic. On November 23, 2018, Butina went to sleep on a blue mat atop the gray cement bed in her cell, her 81st day in solitary confinement. Hours later, in the middle of the night, she was awakened and marched to a new cell, 2E05, this one with a solid steel door and no food slot, preventing even the slightest communication. 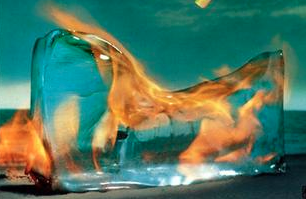 No reason was given, but her case had reached a critical point. That’s true not just for the way Bamford obscures the timeline here — suggesting she was always in solitary — but because by obscuring that timeline, Bamford serves to hide that it was Bamford’s own communications with and about Butina that got her thrown back into solitary. Butina’s lawyers laid out her protective custody status in a filing on November 27. In addition to general population prisoners, the Alexandria detention center houses federal detainees awaiting trial before this court in “administrative segregation,” more commonly known as solitary confinement. This form of restrictive housing is not a disciplinary measure, but is purportedly used by corrections personnel to isolate inmates for their own protection or the safe operation of the facility. Between her commitment at the Correctional Treatment Facility in Washington, DC and then Alexandria detention center, Ms. Butina has been isolated in solitary confinement for approximately 67 days straight. 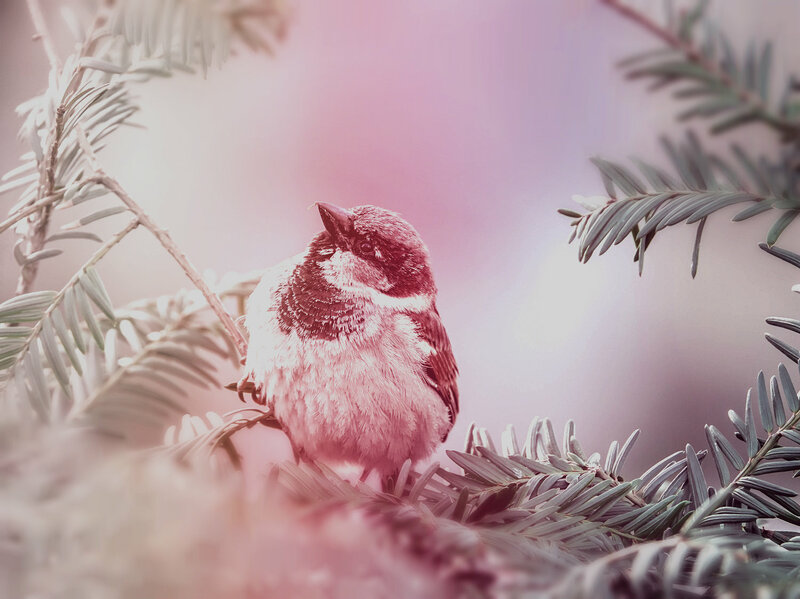 Despite a subsequent release into general population that came at the undersigned’s repeated requests, correctional staff reinstated her total isolation on November 21, 2018 although no infraction nor occurrence justified the same. The timeline they lay out makes it clear Butina was in protective custody from July 15 to around September 21, but then placed in the general population. The timeline is absolutely consistent with Butina agreeing to cooperate in order to get placed in general population (the motion to transport her was submitted September 21, so at the same time she was placed in the general population). The fact that the government uses solitary to coerce cooperation from prisoners deserves condemnation, and that definitely seems to have been at play here. But even at a time she had active orders to be transported for cooperation (the court authorized a second request for transfer from late October through the time she pled guilty), Butina was placed back in solitary. The timeline her defense attorneys lay out, however, suggests that Bamford was incorrect in stating she was in solitary on her birthday on November 10. She wasn’t moved back to solitary until November 21. On the afternoon of November 21, 2018, counsel received a never-before urgent phone call from a jailhouse counselor regarding Ms. Butina. The basis for that call was her return to solitary confinement. The undersigned called Chief Joseph Pankey and Captain Craig Davie in Alexandria in response. After conferring with them, however, it has become clear that the facility’s use of administrative segregation is a false pretext to mask an indefinite solitary confinement that is unjust and without cause. Staff purported to base their decision to segregate on Ms. Butina referring a fellow inmate to her lawyers (that is, she gave her lawyers’ phone number to a fellow inmate), but staff did not find a disciplinary violation—major or minor. Chief Pankey and Captain Davie then resorted to the decision being “for her safety,” knowing that administrative segregation disallows an appeal internally. As of the date of this filing, Ms. Butina has now been in solitary confinement for 22 hours a day for 6 consecutive days with no prospective release date. According to at least one deputy, the move to solitary confinement has also not been entered into the Alexandria detention center computer system, and Ms. Butina’s status is disclosed only by a piece of tape with handwriting attached to the guard stand. And that’s important because of a detail that Bamford remains utterly silent about. As laid out in a hearing transcript, around that time, the government recorded calls from Butina to “certain journalists” suggesting the journalist consult someone who had her lawyers’ first name. DRISCOLL: The conflict raised by the government, I think the government does not think there’s been any violation of order by defense counsel, but due to circumstances regarding recorded calls that the government had of Ms. Butina and to certain journalists, the government raised the concern to us; and we wanted to raise it with the Court so that there would be no question when the plea is entered that the plea is knowing and voluntary, and we wanted to kind of preemptively, if necessary, get Ms. Butina separate counsel briefly to advise her on her rights, to make sure that she got her constitutional right to conflict-free advice. THE COURT: Wait. So, wait. Stop. Part one is a potential conflict. Do you see a conflict because you believe she’s acting at the behest of her attorneys or as a conduit for her attorneys to violate the Court’s order? MR. KENERSON: It’s — someone viewing that in the light least favorable to defense counsel might be able to argue that this is some quantum of evidence that defense counsel possibly were engaged in assisting Ms. Butina in violating the Court’s order. THE COURT: All right. But that goes to whether counsel, with the aid of his client, violated my — and I’ll use the colloquial term for it, my “gag order.” How does that go to — and maybe you’ll tell me; I cut you off. But how does that go to the voluntariness of her plea? MR. KENERSON: So if there is an allegation that defense counsel assisting her somehow in violating the, again, to use the colloquial term the “gag order,” that would give defense counsel a reason to want to basically plead the case to avoid that potential violation from becoming public. And curry favor with the government. Driscoll went on to explain why his client was talking to a journalist with whom she had a friendship that “predates all of this” in spite of her being subject to a gag order. The circumstances, just so the Court’s aware, Ms. Butina has a friendship with a particular journalist that predates all of this. The journalist was working on a story about Ms. Butina prior to any of this coming up, prior to her Senate testimony, prior to her arrest, and had numerous on-the-record conversations with her prior to any of this happening. At the time the gag order was entered, I took the step of informing the journalist that, although he could continue to talk to Ms. Butina, he could not use any of their post gag-order conversations as the basis for any reporting, and the journalist has not, in any event, made any public statement or done any public reporting on the case to date. Bamford’s own description of “a number of long lunches starting last March at a private club in downtown Washington, D.C.” make it clear he is the journalist in question. Judge Chutkan was none too impressed with Driscoll’s advice. THE COURT: Well, putting aside the questionable advisability of having your client talk to a reporter while she is pending trial and there’s a gag order present — and I understand you told the reporter that they couldn’t make any public statements, but as a former criminal defense attorney myself, I find that curious strategy. Now, to be clear: Bamford never did publish anything on Butina during the period when the gag was in place (Chutkan lifted the gag on December 21). Even if Bamford had published something during that period, so long as Bamford did respect Driscoll’s advice that their ongoing conversations should be off the record, there was nothing Bamford could publish that would directly reflect her own statements. And there’s very good reason to question whether the government threw Butina back into solitary because Bamford was reporting on her treatment. That is, it’s not outside the realm of our criminal justice system that Butina was placed back in solitary because a reporter had been tracking her case since before the investigation became public. Instead of laying out the case for that, however, Bamford instead hides his own role in the process. To be honest, I think the story is better understood as one about Paul Erickson and not Maria Butina. This story won’t help her at sentencing — that’s going to be based on her cooperation, not what a journalist who has already antagonized the government says about her. But it may help to spin Erickson and George O’Neill’s interest, as well as that of the NRA. The public record certainly sustains the case that the government used solitary to induce Butina to cooperate — presumably to cooperate against Erickson and O’Neill. That certainly merits attention. But then the government also used solitary to cut off Butina’s communications with Bamford himself. If it’s this story the government was retaliating against, Bamford should say that, rather than obscuring it. This is a story about America’s reprehensible use of solitary confinement. But it doesn’t explain a key part of that process here. Given that the story seems to most benefit Erickson, I find that silence remarkable. The government had another embarrassing docket fail Friday, like the cut-and-paste release that disclosed charges filed in EDVA against Julian Assange. Yesterday, a motion for permission to transport Maria Butina was briefly published to the docket, then withdrawn, but not before reporters who get automatic docket updates got copies. And the details in the filing suggest that Butina’s cooperation may be more limited than Mueller watchers would like. The docket fail may stem from complaints that the judge in Butina’s case, Tanya Chutkan, made back on December 6, about how many details of Butina’s imminent plea deal attorneys were trying to keep sealed. THE COURT: Why? Why is the fact that — you know, Mr. Driscoll, I have to tell you, I’m a little perplexed. In this case, you’ve filed several motions for transportation of your client to the U.S. Attorney’s Office, and you asked that that information be placed under seal; and that was certainly appropriate, and the government joined in that request. And I placed those requests under seal because the possibility of a defendant’s cooperation is always something that is very sensitive. Since Butina’s plea, those prior motions to transport her that Chutkan referenced in her complaint — one dated September 21 asking to move her for a September 26 interview but lasting through October 25, and one dated October 23 specifically authorizing transport on November 7 but lasting through December 6 — were unsealed. Presumably, that’s why Friday’s order got filed unsealed, as well. The problem, per CNN’s report, is that the latest one reveals Butina may be transported to testify before a grand jury in DC. Russian political conspirator Maria Butina is set to meet with federal prosecutors in Washington and Virginia over the next several weeks, according to a court filing that was posted and quickly removed from a federal docket Friday afternoon. “The purpose of the transfer is to interview the Inmate concerning an ongoing federal investigation,” the filing says. So in addition to providing details about Butina’s future travel (possibly even a date) that might pose a security risk or put her in physical danger, it includes grand jury information that is supposed to remain secret. All the filings together, however, reveal something of more interest: Butina has been proffering information to the Feds, probably primarily against her boyfriend, Paul Erickson, since September 26. She was submitting to interviews in this investigation at a time when Erickson was regularly visiting her in jail. Despite the ongoing investigations and his reported ties to Butina’s activities, Erickson frequently visits her in jail, two individuals with knowledge of the meetings told The Daily Beast. Erickson apparently expressed frustration to friends over the fact that jail staff forced him to sign into the main visitor log, fearing the media would find out. You know how everyone hopes that a cooperating witness might wear a wire? In Butina’s case that could, potentially, have happened during her meetings with Erickson (though in the context of a jail visit, would hardly be necessary to capture the couple’s conversations). The period of her cooperation also sort of matches the time when she got moved from protective custody into the general population in Alexandria (67 days after her arrest would be September 20); she was subsequently put back in solitary, possibly because (as was discussed at the December 6 hearing) she had been communicating with the outside world via other detainees and at least one journalist. While those revelations are of interest, what’s equally notable is the geography described, at least in the public filings. As noted, CNN says she’s cooperating on a federal investigation, singular, which is what the past motions said as well. And the locales to which she can be transported in the public filings — an interview room attached to the Alexandria jail, the DC US Attorney’s office, and a DC grand jury — don’t include Robert Mueller’s office, which is a different location in DC. There may be some involvement of the EDVA US Attorney’s Office (which might bode ill for the NRA, which is headquartered in that district). But thus far, there’s no sign that she’s being transported to cooperate with Mueller’s office. That’s consistent with her plea, which only describes cooperation with the DC US Attorney’s office. The plea deal is in no way definitive — after all, Mike Flynn’s plea said he’d cooperate “with this Office,” meaning SCO, but he has recently told us about cooperating with “other components of the Government” and the addendum to the government’s sentencing memo seems to reflect at least one criminal investigation outside of Mueller’s mandate (which is widely believed to involve Turkey). But Butina has already been in custody almost as long as she’s likely to be sentenced to, meaning to do much more would entail holding her in jail to get her to cooperate for no benefit, something her lawyers presumably would be unwilling to countenance. So it may well be that she has told investigators about her boss (who, of course, retired suddenly not long ago) and her boyfriend. She may well even had gotten Erickson to incriminate himself in a venue where prosecutors easily collected it. There’s no evidence, however, that she’s cooperating with Mueller or expected to. Though Marcy has already discussed Maria Butina’s recent attempt to avoid prosecution as a Russian spy under 18 USC 951, it’s worth comparing two Russian women charged on different occasions with violating the same act. There are some similarities including the hair color, and some key differences — Chapman and Butina aren’t clones. Their behavior and achievements in the U.S. on behalf of Russia suggest a change in methodology over time. Butina’s mission appears to be similar, but there’s no decrypted message included in the Department of Justice’s Arrest Affidavit to compare with that in Chapman’s indictment. We must rely on Butina’s translation of another document she shared by email with ‘US Person-1,” believed to be Paul Erickson. Both Chapman and Butina had missions or assignments; Butina’s appears to be worded more loosely but a full text of the email is not publicly available to make a more accurate assessment. Both women were expected to get close to and develop relationships with U.S. policy makers. What may explain why Butina’s mission is worded a little differently: between the time Chapman receives her assignment and Butina shares her mission with U.S. Person-1, the policymakers have changed from Democrats to Republicans. The Democrats were also much more difficult and distant; we can see in other interactions between Illegals Program spies including Chapman that targets weren’t as readily engaged as U.S Person-1. Though Americans who interacted with Illegals Program spies were amazingly credulous, the spies still didn’t get very close to their intended target, Hillary Clinton. By the time Butina began her work in 2011, methods had changed. 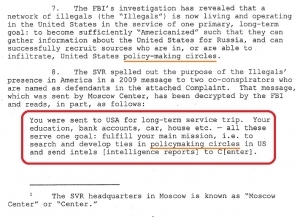 Instead of tradecraft seen in the Buryakov case circa 2013-2015 and the earlier Illegals Program circa 2010, Butina is initially accompanied by a Russian official – no need for Butina to implement additional traditional tradecraft to report intelligence when they are their own channel, subordinate spy to superior and minder. Once a relationship between Butina and US Person-1 had been well established, tradecraft was even more nominal – we don’t see in the Arrest Affidavit anything more complicated than a commercially available laptop computer and cellphone. 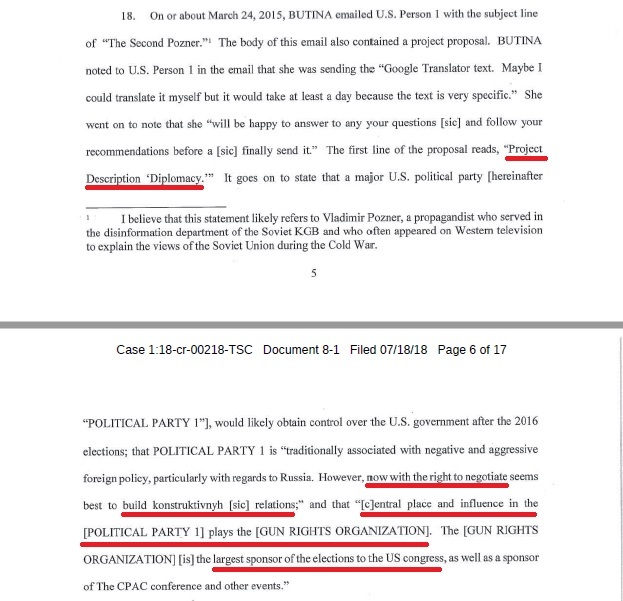 The descriptive name of the assignment on which Butina worked also indicated a shift — “Project Description ‘Diplomacy'” — to building constructive (konstrucktivnyh) relations with an organization central to influence over the Republican Party, with an understanding that they (Russia in concert with Political Party 1 and Gun Rights Organization) had some ‘right to negotiate’. This is far more substantive than Chapman’s assignment to seek and develop ties with key contacts. — Change from Clinton to Kerry as Secretary of State likely played a role given the expectation Clinton would be the front runner for the Democratic Party’s presidential nomination. But one key factor may have changed the tack Torshin and Butina took compared to Chapman and the Illegals: the Supreme Court decision in Citizens United, Appellant v. Federal Election Commission on January 21, 2010. Now there was a means to funnel money to meet Torshin’s and Butina’s efforts without the level of difficulty other methods might have had before 2010. They could identify, meet, target, influence, and point to a candidate the NRA could fund using Russian money — in effect, developing and recruiting unwitting (or witting) agents. They collected Republican members of Congress to exploit as useful idiots, in other words. No wonder Butina had to hide behind a seemingly innocuous student status. Besides masking the reason why she was in the U.S., she needed to appear lower on the cultural status scale than the GOP’s easy marks on which she worked. In contrast, Chapman only needed the appearance of a real estate gig to enable her to poke around. Note again in the excerpt from the DOJ’s Arrest Affidavit the ‘right to negotiate’ — does this suggest that Citizens United, combined with NRA’s welcome, that Russia felt it had an alternative (read: illegitimate) path to diplomacy, circumventing a Democratic White House between 2011 and 2017? 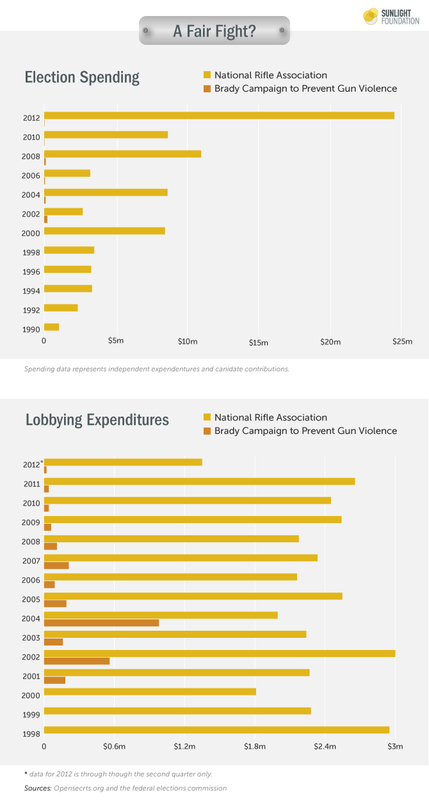 It’s clear something changed after 2010 at the NRA with regard to allocation of money between lobbying and campaigning. 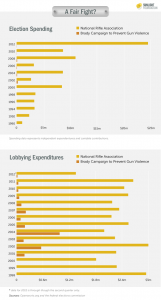 In 2012 the NRA also transitioned away from relying as heavily on the American Legislative Exchange Council (ALEC), doing more of its policy work and outreach directly through GOP candidates. ALEC executed a PR feint — backing away publicly from gun rights issues and the Stand Your Ground laws it helped promote — but in reality it was ceding to the NRA these efforts because ALEC was no longer needed after Citizens United as a legislative front. The NRA could handle their issues directly with candidates under the guise of campaign support. The rest is history, with Butina taking selfies with NRA’s president David Keene and various GOP candidates to document her benchmarks along the way through Trump’s 2016 campaign. Butina’s legal team may argue against a charge of violating 18 USC 951 as a negotiating chip, claiming she didn’t spy. If either of these red-capped sparrows could have claimed they weren’t a spy, it wasn’t Butina. Her mission was successful in a way Anna Chapman could only have dreamed. 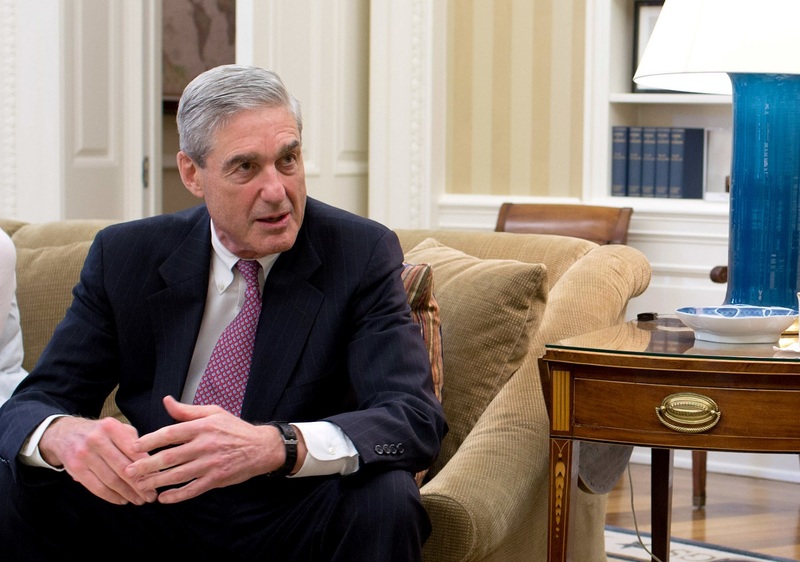 One key prong of Republican propaganda attempting to discredit the Mueller investigation has been to claim Trump associates were targeted by informants. Perhaps the most brazen example was when Roger Stone claimed a Russian whose offer of dirt he entertained (but claims to have refused to pay for) was an FBI informant. But George Papapdopoulos has spawned an entire subindustry of such claims. It appears that Maria Butina’s attorneys have adopted that approach. In a letter to her attorneys the prosecutors posted to the docket the other day, they insist (as DOJ has had to insist to Republicans in Congress) that they are not sitting on evidence of approaches by informants. During our previous discussions, you have advanced certain hypothetical scenarios involving your client, including a supposed “dangle” operation or the acquisition of exculpatory information from “Cis,” which we take to mean confidential government informants. It appeared at the time of our discussions, that you based these ideas not on firsthand knowledge of any events, but rather on speculation based on claims made in some unidentified media articles. Inexplicably, however, in your October 18, 2018 email, you–for the first time–firmly assert that “[w]e know this information exists [and] have called it out by name…” [emphasis added]. The government was surprised by this newly adamant assertion, and we invite you to provide us any additional information you may have concerning the provenance or existence of the information you request. Notwithstanding its speculative nature, the government took your original request seriously and made specific inquiries about the hypothetical scenarios you advanced. Regarding the scenarios described in your October 18, 2018 email, based on our reviews to date, we are not aware of any information that would trigger any disclosure obligations regarding either a “dangle,” successful or otherwise, or information obtained from any confidential informant. We are aware of no surveillance targeting your client that occurred prior to in or around [redacted] We will obviously continue to review the government’s holdings for such information, as well as any additional surveillance records of your client and we will continue to discuss with you any other materials that you consider potentially exculpatory. If that ongoing review yields information that should be disclosed to you, we will certainly do so. Don’t get me wrong. DOJ has a history of playing games with discovery, or of interpreting discovery narrowly so as to hide other prongs of an investigation. So the allegation from Butina’s lawyers, by itself, is not outrageous. Except it seems to be a part of the Devin Nunes/Mark Meadows/Jim Jordan propaganda effort in Congress, driven by a bunch of half-wits who leak information that they don’t understand. Indeed, this incident raises real questions for me on whether the House effort has now taken not only to defending Donald Trump, but also Maria Butina, an alleged foreign spy whose own writings indicate Putin knew of her operation. Meanwhile, DOJ’s letter to Butina’s team reveals that they have not picked up a hard drive of discovery DOJ made available a month ago. With respect to materials provided to you so far, we have made an FBI CART examiner available to you to help you navigate the electronic evidence, and we made a second hard drive of electronic evidence available to you over a month ago, which you have thus far reclined to retrieve. The claim that Butina’s team has left evidence sitting for a month comes just days before Russia’s Foreign Affairs spokesperson, Maria Zakharova, claimed that DOJ has not handed over discovery to her and used that to claim DOJ is treating her unfairly. It is baffling that the court considering Maria Butina’s case has not yet handed over the case material to her, although the hearing is scheduled for November 13. Unfortunately, this gives us yet another reason to doubt the impartiality of American justice system. Again, it is not unheard of for DOJ to play games with discovery. But in this case, particularly in context of obvious propaganda serving Trump and other Republicans’ interest, it seems like Butina’s defenders both in and outside the country have decided on a disinformation strategy rather than a direct defense of her case. Update: The parties just asked for Butina’s case to be put off for three weeks to deal with discovery. Maybe in the interim, the government will find the evidence of informants sidling up to Butina that the claim is not exculpatory. Is a Tie with Vladimir Putin What Makes Mariia Butina More of a Spy than Paul Manafort? Given my continued obsession with the border between the spying charge (18 USC 951) with which Mariia Butina got charged and the FARA charge (22 USC 611 et seq.) with which Paul Manafort got charged, I find this footnote from the government’s opposition to Butina’s request for bail of particular interest. 14 The defendant also attempts to rely on the government’s search warrant seeking “evidence of a potential violation under FARA.” ECF No. 23-1 at 7. As the defendant later acknowledges, id. at 15, the search warrants the government obtained for the defendant’s residence authorized it to search for potential violations of 18 U.S.C. §§ 371 and 951, as well as 22 U.S.C. § 611 et seq. It reveals that at the time they searched Butina’s residence on April 25, 2018, the FBI had not determined whether they considered her just a sleazy foreign influence peddler or a spy. The government had explained that, in that or a subsequent search they found several pieces of evidence she had ties to the FSB, including a note reflecting a job offer. The search also included access to her devices, which revealed a slew of “taskings” from Aleksandr Torshin, which the government will use (if this ever goes to trial) to prove Butina worked as an agent for the Russian government. So that may be one of the things that led them to charge her as a spy, rather than just a sleazy influence peddler. The opposition filing provides more details, however, that may explain the charge. I had noted, here, that one difference between Butina and Manafort likely stemmed from her necessity to lie to get a visa, something the government repeats here. In 2016, the defendant applied for and was granted an F1 student visa to study at American University in Washington, D.C. On her application, she identified her current employer as “Antares LLC” and described the Russian Official as a previous employer. Nonetheless, once resident in the United States, the defendant continued her efforts at the direction of the Russian Official to establish connections with U.S. Political Party 1 and other U.S. officials and political operatives. They also defend a claim they made about her current visa, which she obtained to ensure she’d be able to travel back and forth from Russia, another detail the defense had spun to great effect. The defense asserts, ECF No. 23-1 at 13 n.12 & ECF No. 23-8, that the government made a misrepresentation regarding the type of visa for which the defendant recently applied and implies that it did so intentionally. The government acknowledges the error in its Memorandum in Support of Detention regarding the label it applied to the visa. ECF No. 8 at 8. But the substance of the government’s contention—that the defendant could travel to and from the United States per her new visa’s terms, but not per the terms of her F-1 visa after her graduation—is true of the Optional and Practical Training visa extension for which the defendant applied. In other words, the “B1/B2” label the government used to describe the visa was incorrect, but its underlying its argument was correct. But this filing also adds further details of how pre-meditated Butina’s plan was, describing a plan she wrote up in March 2015. Beginning as early as 2015, the defendant wrote a proposal intended for Russian officials laying out her plan to serve as an unofficial agent or representative to promote the political interests of the Russian Federation vis-à-vis the United States. 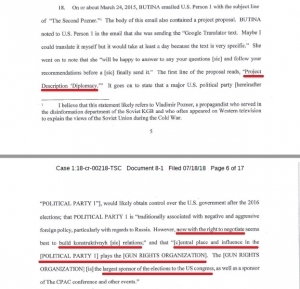 In 2015, the defendant created a document entitled “Description of the Diplomacy Project,” in March 2015, which included a proposal to cultivate political contacts in the United States. 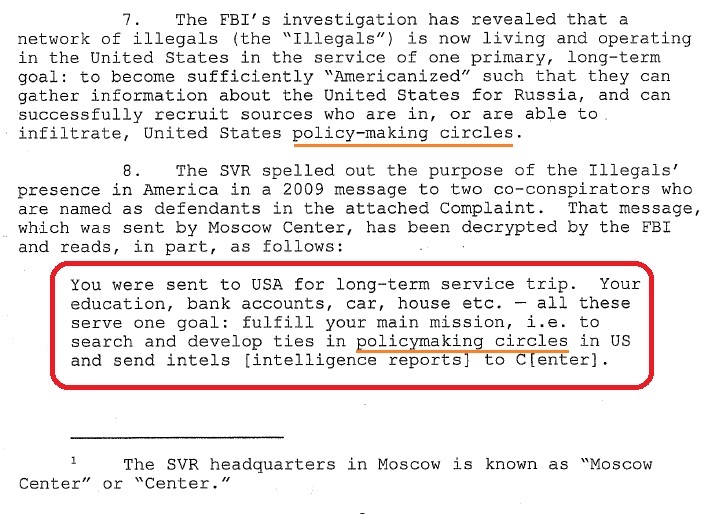 Interestingly, amid a list of Russian officials the FBI has evidence she had contact with, is a phone call she had with Sergey Kislyak in May 2015, when this operation was still in the planning stages. It describes Erickson pitching Putin’s involvement when arranging for the Russian delegation to the National Prayer Breakfast. Reaction to the delegation’s presence in America will be relayed DIRECTLY to President Putin and Foreign Minister Sergey Lavrov (who both had to personally approve the delegation’s travel to this event). And that Putin involvement came at the last minute — the weekend of January 20-21, 2017. All of which may explain why the Russians have made such an effort to pressure for Butina’s release. Since the detention hearing in this case, the actions of the Russian Federation and its officials toward the defendant have confirmed her relationship with, and value to, her own government. To date, the Russian government has conducted six consular visits with the defendant. It also has passed four diplomatic notes to the U.S. Department of State.2 According to the Russian Ministry of Foreign Affairs, Russian Foreign Minister Sergey Lavrov has spoken to the U.S. Secretary of State twice to complain about this prosecution.3 The official Kremlin Twitter account changed its avatar to the defendant’s face and started a #FreeMariaButina hashtag. 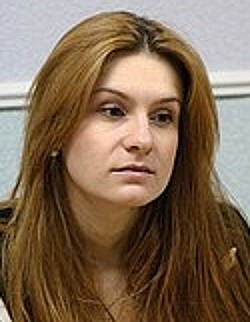 RT, a Russian television network funded by the Russian government, has published numerous articles on its website criticizing this prosecution and the defendant’s detention.4 Russia has issued more diplomatic notes on the defendant’s behalf in the past month than for any other Russian citizen imprisoned in the United States in the past year. Put simply, the Russian government has given this case much more attention than other cases. 2 Diplomatic notes are used for official correspondence between the U.S. Government and a foreign government. The Department of State serves as the official channel for diplomatic communications between the U.S. government and a foreign government. 3 Press release on Foreign Minister Sergey Lavrov’s telephone conversation with US Secretary of State Mike Pompeo, July 21, 2018 available at http://www.mid.ru/en/web/guest/foreign_policy/news/-/asset_publisher/cKNonkJE02Bw/ content/id/3302434 (last accessed Sept. 7, 2018); Press Release on Foreign Minister Sergey Lavrov’s telephone conversation with US Secretary of State Mike Pompeo, August 23, 2018, available at http://www.mid.ru/en/web/guest/foreign_policy/news/-/asset_publisher/ cKNonkJE02Bw/content/id/3323966 (last accessed September 7, 2018). Though, of course, some of this is the simple counterpart to what Butina’s attorneys complain DOJ is doing: because she’s a pretty woman, she makes for good propaganda that Russia can use to accuse the US of abuse. Still — Butina has gotten more reported attention than even Yevgeniy Nikulin, another case the Russian government has shown exceptional interest in. Her lawyers’ opposition to a government bid for a gag order repeats, in more dramatic fashion, a claim they had made in their bid for bail: that the government has presented no evidence of traditional tradecraft. 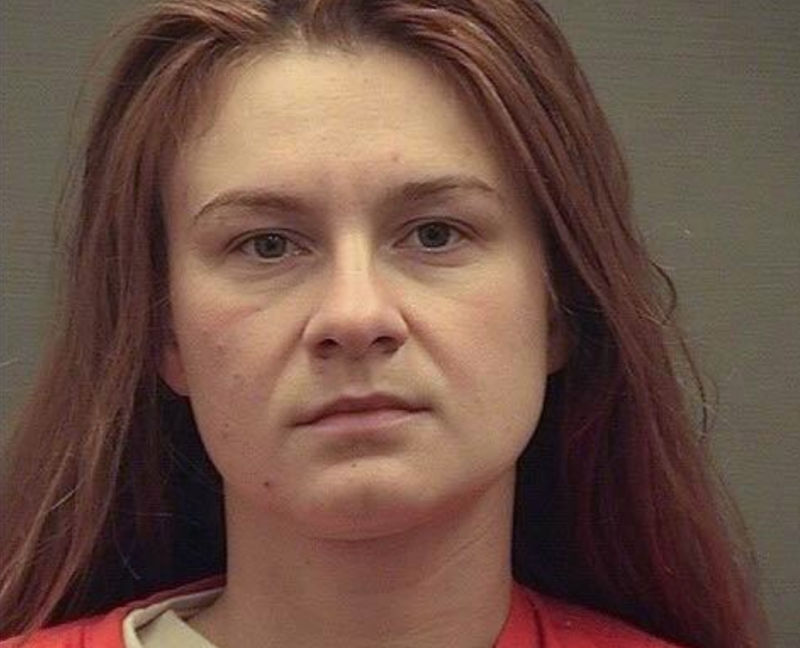 Maria Butina is in a cell, pretrial, 22 hours a day for crimes she did not commit and for government falsehoods and never-tested theories of culpability that have not (and will never) pan out. For all of the government insinuation and media coverage of Hollywood style, spy-novel allegations, in reality this case is bereft of any tradecraft or covert activity whatsoever. There are no dead drops, no brush passes, no secret communication devices, no bags of cash or payoffs, no bribes, no confidential secret information gathering, no espionage type activity, and no agency or agreement to commit crime. The elements of a violation of 18 U.S.C. 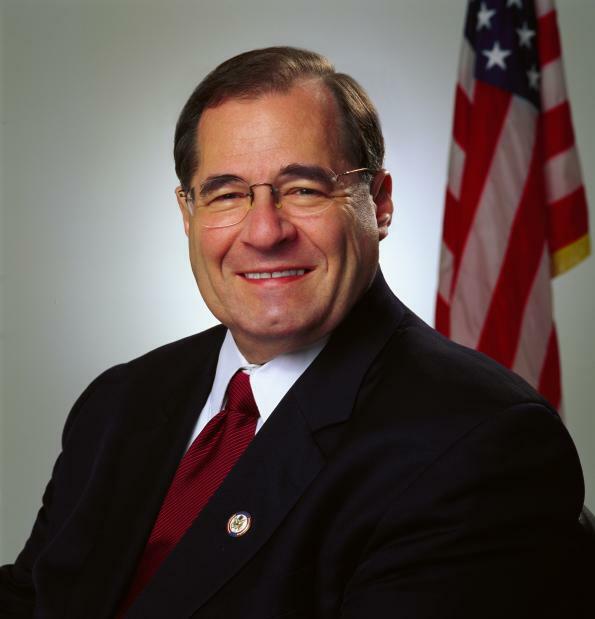 § 951 are that (1) the defendant acted in the United States as an agent of a foreign government; (2) that the defendant failed to notify the Attorney General of the United States that she would be acting in the United States as an agent of a foreign government prior to so acting; and (3) that the defendant acted knowingly, and knew that she had not notified the attorney general. One final thing: this opposition motion makes it clear how pissed Butina and Torshin were when news of the DNC hack broke, knowing it would focus more attention to their own operation. And it describes Butina first latching on to Scott Walker before picking up with Trump. It describes the arc of the operation as an attempt to be well-positioned after the 2016 election. [Butina] was working as an undeclared agent on behalf of the Russian Federation to position herself and that official to exert Russian influence over U.S. policies towards Russia after the 2016 Presidential election. All that leads me to believe that the government is beginning to view the Torshin operation as a parallel effort to the election hack one, an effort that had Putin’s direct involvement in. So it’s not just that the government has decided she has real ties to Russia’s spooks. It’s that the scope of her effort, and the involvement of Putin, raises the stakes for her custody, but also for any attempt to learn how these operations fit together. https://www.emptywheel.net/wp-content/uploads/2018/09/Screen-Shot-2018-09-03-at-9.55.02-AM.png 931 1150 emptywheel https://www.emptywheel.net/wp-content/uploads/2016/07/Logo-Web.png emptywheel2018-09-08 23:43:442018-09-09 08:16:07Is a Tie with Vladimir Putin What Makes Mariia Butina More of a Spy than Paul Manafort? Had a busy day yesterday and then came to the stark understanding that a significant contributor to this blog had included a Styx Grand Illusion video in a post. I am hoping you can imagine my dismay! I still have not recovered. I just….I cannot….even. Despite the ill video, the post was great and spot on. But, damn, that video. And placing that earwig junk in the minds of not just me, but countless others. Unforgivable. Here is the real deal, from the time when Styx actually was more than bubblegum cheese. Midnight Ride. Currently WordPress is not allowing me to post it at the top where I want it, and normally would, but will do so at the bottom of this post. There was a Styx period where they were okay, if not very decent. It was LONG before Grand Illusion, which is simply, and truly, horrible. The attached song Midnight Ride was from the James Young era, this is a live version off of the original on Equinox, before the pop rock crap of Dennis DeYoung and Tommy Shaw took control of a decent band. That was a long time ago. And if you want some more off of Equinox, go UTube Lonely Child and Suite Madame Blue.